Philosophy- I try not to be trapped by living with the results of other people's thinking. By not letting the noise of other's opinions drown out my inner voice I am able to have the courage to follow my heart and listen to my intuition. Somehow my inner voice knows what the painting wants to become and brings it to life. I am an artist residing in Toronto, born in Edmonton in 1957, and a graduate of Sheridan College Institute of Design and Technology. I have enjoyed a successful career in advertising as a Graphic Designer and Creative Director. Recently I decided to pursue my life long passion for fine art and portraiture. 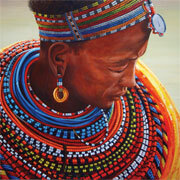 I paint in a realistic style capturing the atmosphere, beauty and sprit of woman of different cultures. 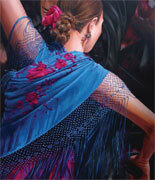 The woman's emotions are portrayed though their expression, backgrounds and the ambiance. I have become interested in how different cultures adorn woman with colour and textures to enhance their natural beauty. The medium I choose to work in is acrylic. Through a realistic painting style, I am able to convey the character clearly and effectively portraying the women in all their beauty. I am enjoying my journey of discovery in art and culture and hope to inspire and stimulate others through my work.